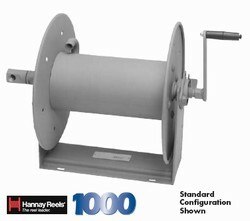 1020-14-16, COMPACT MANUAL REWIND REEL To handle single 275 ft. of 1/4" or 175 ft. of 3/8" I.D. hose. See detailed spec sheet here for dimensions and addiotional information. Great for Pressure Washing, Spray Operations, Washdown and Air.